Super Savings Item! Save 40% on the Super Deal Upgraded 48'' X 36'' 1/8'' Heavy Duty Carpet Chair Mat w/Lip, Transparent Chair mat for Office Chair Rug Carpet Floor Computer Desk Low and Medium Pile Carpets (#2) by Super Dea at Momiji Studios. MPN: SD0711. Hurry! Limited time offer. Offer valid only while supplies last. Our PVC mat is rolled before shipment, it might be hard to roll out when receive it. Simply spread it out and put something on it for 2-3 days. Our PVC mat is rolled before shipment, it might be hard to roll out when receive it. Simply spread it out and put something on it for 2-3 days. Perfect for low pile carpet thicknesses of 1/4" or less. TIP: To determine the thickness of your carpet pile, place a penny on it's edge down in the carpet pile (like measuring a tire tread). If Lincoln's chin is above the carpet pile, your carpet is 1/4" or less. Note: If the mat would not lay flat on the floor, then you should try to use a hair dryer on the mat with high heat for about 15 minutes. It will soften the plastic enough that the mat will lay flat. Made from polycarbonate, a tough and firm material which will not crack, curl, discolor or smell. This thick and sturdy plastic desk mat protects office carpet from damanging by moving chair casters. 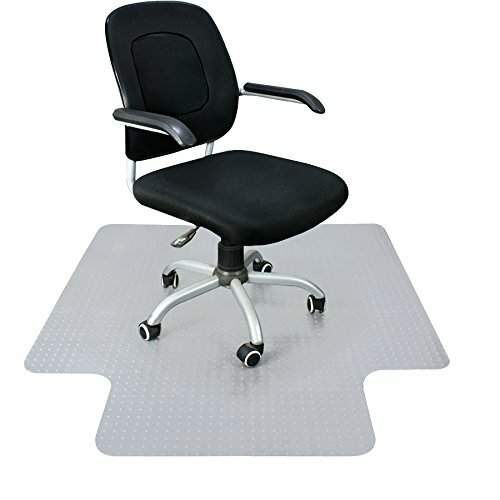 This textured wear resistant pvc chair mat allows your office chair to move easily without skidding. Lies perfectly flat right away and has an easy glide surface to help reduce leg fatigue. Environmental friendly, 100% recyclable; free from toxic chemicals and PVC; child and pet safe; Greenguard certified. This clear rectangular soft floor chair mat demonstrate natural beauty of your carpeted floor. ✦ UPGRADED 1/8 inch enhanced thickness to achieve no dip, crack-resistant, curl-resistant and durable. ✦ Features dimples on the back side of the mat& A rectangular lip to cover the carpet under your desk when your chair pushed all the way in. ✦ Crack-resistant, curl-resistant chair mat with lip for carpet aims to provide the ultimate protection to low, standard and medium pile carpets. ✦ This Rolling chair mat for carpet features superb impact strength and hardness enable office chair roll smoothly with ease on it, super easy to clean and maintain. Mat Size: 48"x36"/ 120 x 90cm, Mat Thickness: 3mm (1/8"). An easy solution to protect your floor. If you have any questions about this product by Super Dea, contact us by completing and submitting the form below. If you are looking for a specif part number, please include it with your message.